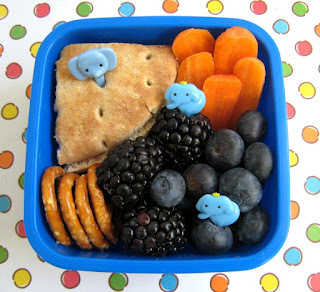 Settling in and back to our routines, so it was decided that Ben needed a "Ben's favorites" bento. And no "Ben's favorites" bento is complete without having some Peanut decorations! Ben has cream cheese and blackberry pomegranate jelly on 100% whole wheat sandwich rounds, a few pretzels, carrot sticks, blackberries and blueberries, all accentuated with Peanut picks. The lack of a cheese Peanut is due to the lack of cheese slices, we'll need to buy some for our creations! I saw some muffin tins with variety of fruits and stuff in Family Fun magazine and thought of your Muffin Tin Moneys.. Then I looked at the picture and saw your kids. I really liked that idea of adding your own combinations to muffins.